A few years back I had a paradigm shift in thinking, equivalent to an antonym. I went from thinking God, Jesus, was closer to me on one ‘special day’ of the week–subsequently, every other day of the week was secular–to realizing that God, Jesus, dwells in me EVERY day of the week–subsequently, every day of the week is holy. Some of you may say duh, everybody knows that! But I didn’t. It has changed my life profoundly. How? I’ve gone from seeing a specific church and a specific day as the means to serve/worship God best and as the day He is available to me the most, to internalizing the fact that I am an indwelt being (the temple of God) and every place I go, every day of the week and everything I do and every moment of my life has potential of being transformed into extraordinary, because Christ is in each of the moments of my life. 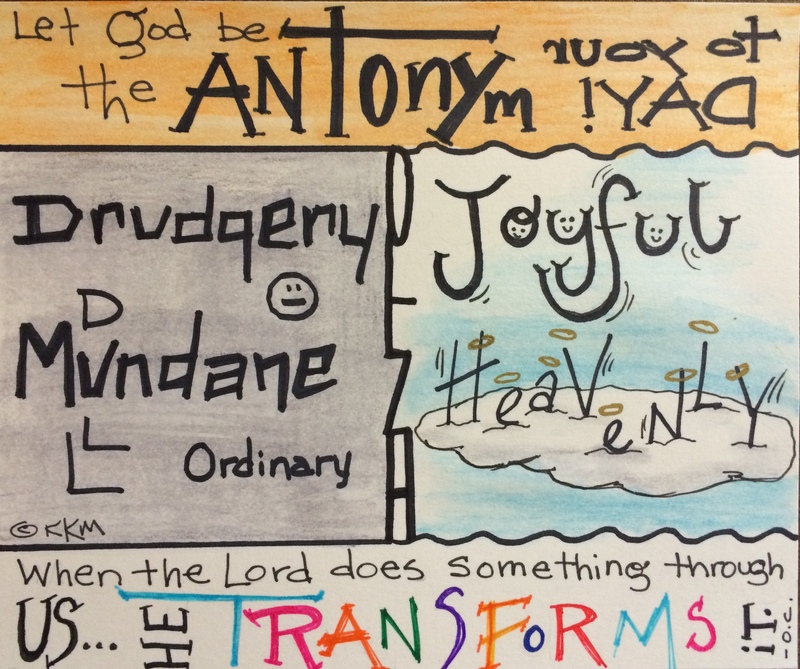 What does that have to do with letting God be your antonym? Everything! All the ordinary things of your life, like Jesus washing the feet of the disciples, can have an extraordinary–heavenly–impact on whatever you are doing. It makes cleaning the house, grocery shopping, digging a ditch, running the kids to school, going to the doctor, walking the dog (worse yet, cleaning up after the dog)…special, because Jesus is doing the work in you. Living in each moment, purposefully conscious of that fact will take your moments, hours and days from mundane to its antonym–Heavenly. Try it today. Let me know how it goes.